Live how you want to – worry free! With the most spacious suites, the largest variety of floor plans, and the most beautiful and bright buildings, no retirement community in Peterborough and the Kawarthas can match The Gardens of Peterborough. Next to the quality of our Care services, our facilities are the thing we are most proud of—and they are what set us apart from all the others. We can also offer an unmatched choice of locations. For proximity to everything that matters including restaurants, shopping, churches, the local hospital, medical centres and public transit at the front door, come and see for yourself. One of the most unique design elements of The Gardens of Peterborough is how much bright, open space there is. We encourage you to compare. Only The Gardens offers more than 60% "common areas" in our retirement communities. 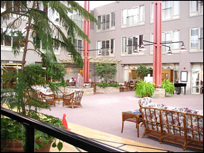 Our beautiful, spacious Atriums are indoor parks which provide a pleasant place to walk or sit and have a chat in the sunlight amidst plants, trees, and fountains. The perfect place for social events, games, and gatherings of any sort, the Atriums become a lovely focal point for our communities. Our communities are designed to provide a multitude of places to gather for chats with friends and family, to sit quietly beside a fire with a good book, and for our frequent social activities. Choose among our many tearooms, fireside lounges, patios, decks and licensed lounge areas. Our dining rooms are tastefully designed and offer the ideal balance of bright open space and privacy. All common areas are wheelchair accessible. One of the things our residents comment on most frequently is how "clean" our buildings are. Our staff takes a great deal of pride in these comments and they are always happy to attend to your every need. Enjoy the comfort and familiarity of your own suite decorated with your own possessions and belongings. We encourage our residents to bring their furniture with them, as well as keepsakes, paintings, and pictures. An in-room kitchenette, bright bathrooms, ample living areas, and available storage space are only a few of the finishing touches which make each of the units both welcoming and practical. Heating and air conditioning are individually controlled for your comfort. For extra safety and security, each suite has an emergency response call-bell system so that you can contact our on-site registered staff around the clock if you need to. Looking for a floor plan?